Seeing a bighorn sheep from a distance is pretty cool. But seeing a flock only 50 feet away is an awesome event. I had just mentioned to Jon that the Checkerboard Mesa area of Zion National Park, which we were driving through, is home to about half of the sheep in the area. We come around a bend, I complain about the tourists parked on the road, and then I see them. I’m giddy with excitement because any animal I see that does not live in Ohio is worth seeing to me. I find a spot in a pull off, which all visitors should do, and we head to check out the sheep. 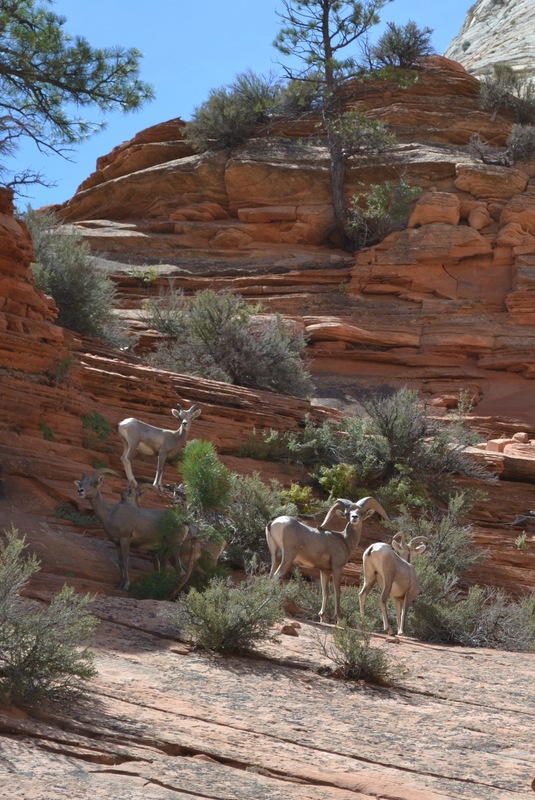 Bighorn sheep on the Checkerboard Mesa at Zion National Park. After a few minutes, the sheep were tired of the spectacle and moved on, but not without the head male showing off his horns to the crowd. This entry was posted in North America, Photos, U.S., Wednesday photo and tagged National Parks, Native animals, Photos, Travel, Utah. Bookmark the permalink.